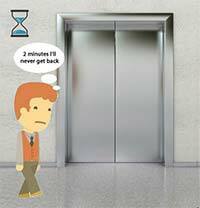 What determines the weight & quantity of elevator / lift required? What to consider before arriving at Number of Elevator/Lift required and capacity of elevator/lift. Lifts/Elevators are bare essential rather than luxuries particularly for a high rise (high multi-storey) buildings. Occupancy and market value of building/complex is dependent on the facilities provided, of which lifts/elevators are one of the most important consideration. Not only presence of lifts but its operational efficiency, aesthetic quality and user friendliness are important aspects for overall valuation of the structure. Less number of or low capacity elevators will increase the waiting time for passengers and add to the dissatisfaction of users, whereas large number of lifts will be a waste of space, energy and add to maintenance expenses. Therefore it becomes imperative to optimise the capacity and quantity of lifts for maximum efficiency and comfort of occupants. Below is the list of few factors which need to be kept in mind to come to conclusion. This can prove to be tricky, since all the occupants may not require the lift at same time and also if it’s an office building they might have different usage hours. For a hospital/institutional building there may be high both way traffic, all day, whereas for resident apartments/office it would be peaking at particular time. Still the rate of flow of passengers can be arrived once we estimate the total occupancy along with probable timings during the day; we need to be sure what purpose the building is going to serve. Some industry/institutes have more staff while others have less staff coming daily in the office. For example a call centre may have more number of employees and even employees working in shifts, whereas a project based company have more person visiting field sites for weeks rather than in office. Total Space and purpose for which building is being used is most important to Estimate the number of people lifts are going to serve. This technique helps us determine the dispersion of traffic in the building i.e numbers travelling to various floors at what intervals. Here we need to take care in case of Parking at basement or restaurant at the Top would affect the traffic pattern. For example a parking facility in the basement would lead more traffic going up from basement during morning and evening office hours and lunch time high traffic would be for the top floor restaurant from each floor. For more accurate results traffic analysis also considers the reduction in traffic due to occupants using staircase for 1st, 2nd or 3rd floors. 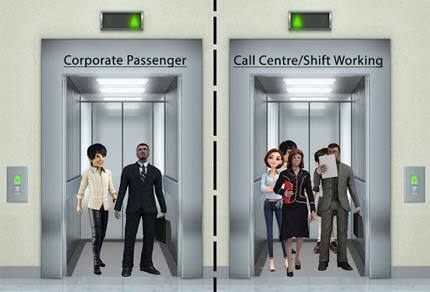 Analytical lift calculation procedures are usually accurate in addressing specific passenger traffic pattern. It consists of up peak analysis describing the morning incoming peak in an office building, a down peak the reverse, A two way peak describing a combination of up and down peak traffic (e.g. hospital/school) and the inter-floor analysis allowing passengers to arrive at any level, assuming their destinations are always in proportion to the individual floor populations, which may not be true all the time. These Analysis procedures when implemented on a computer, allows analysis of any peak passenger flow for any practical configuration of lifts. Based on traffic analysis Lifts can be operated what is called Peak time Modes (Up Peak Mode or Down Peak Mode).A particular mode is set on the basis of traffic requirement (Up peak on start of day and Down Peak on day end).The lift on reaching the last called floor is directed back to lowest/highest floor and continue the operation for set time, rather than waiting at any floor. Repetition of above till Exit of the last passenger. Increasing the Number of Lifts can reduce the Waiting time considerably but increasing the lifts have following constraints. Cost constraint: lifts have once time buying cost as well as recurring O&M cost. Infrastructure Constraint: require electricity to operate, load increases with no. of lifts, also some older versions require Machine rooms to operate lifts. Space Constraint: lifts occupy otherwise usable area of the building. Therefore one has to strike a balance between the number of lifts, capacity of lift and average waiting time. Optimising all three would be necessary. Many engineers /designers with the help of computers are trying to formulate complex computer models which can give unrealistically precise predictions of our imprecise world. For any such model to give us good results the input is required to be accurate, which for this case can be bit difficult. But it is possible to deduce the effects on lift service of any Passenger Lift traffic flow in existing building and applying the logics from same to predict for a new building or measured in an existing building and applying the corrections. Therefore hiring a good consultant with vast experience can also serve the purpose and will at least not make elevator a bottle neck for your high rise transport.